One of my favorite family traditions is how we celebrate on Christmas morning. Now that my siblings and I are all grown, we don’t necessarily jump out of bed at 7 am to open presents. Instead, we allow ourselves to lazily take our time to get up, and then gather together in my family’s living room to open our stockings. After we open the stocking stuffers, but before we start to exchange our presents for one another, my mom pulls cinnamon rolls out of the oven. Maybe I’m just oddly obsessed with food, but there is something so special about eating the cinnamon rolls, sitting beside our tree, and our roaring fireplace. The fire crackling, the needles falling from the month-old tree, and the glorious smells of cinnamon rolls wafering through the entire home — there is nothing like it. One year, many years ago, my mom forgot about making cinnamon rolls. It truly wasn’t her fault, as she had so much more on her plate that Christmas, and was an honest mistake. She quickly started whipping up a batch, which we would come to enjoy, just delayed from when we normally did. I would like to blame our poor attitudes on our young age, but we were in high school. Needless to say, when we finished with stocking stuffers that morning, everyone was pretty upset. Why? Because a tradition that we had held so dearly was broken that year. Traditions bring warmth, stability, contentment, and reliability. In a season — no, in a life — that is so unpredictable and ever-changing we seek refuge in these small but important moments that come to become a part of who we are. This year, friends, I challenge you to look towards one consistent thing that each and every one of us have in common. While Christmas looks different for every single one of us, there is one constant that is never changing. Jesus is never changing. He will be forever, who He has always been. His is consistent in His love, His compassion, His joy, His comfort, His protection, His wisdom, His peace, and most of all in His death. This year when traditions fade or mishaps take place (because they likely will) take a step back and remind yourself where the ultimate form of consistency is found. 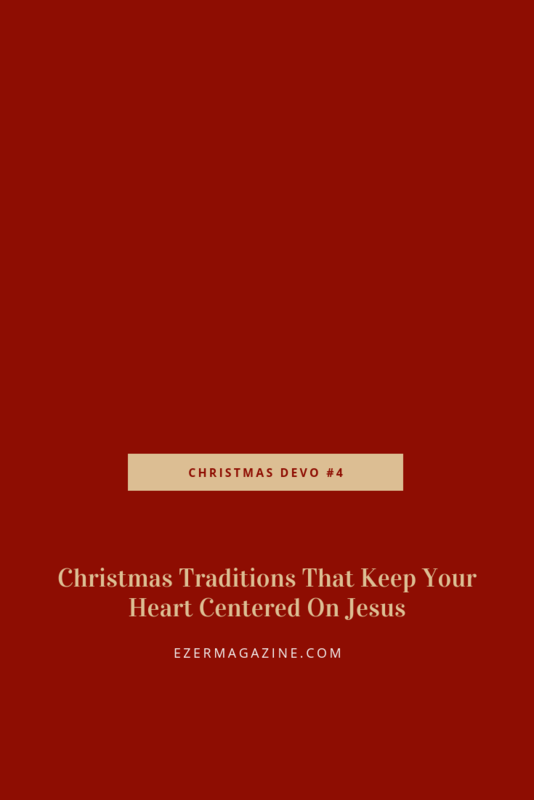 Instead of allowing derailed traditions to destruct your days or celebrations, instead set your sights on the constant that we are celebrating not only in this season but year round. Did you miss DAY THREE of our Christmas Devotionals? Click here to check it out. This morning, I want you to think about your favorite family tradition. How would you react if something came in the way of this tradition’s usual happenings? Today, how can you align your attitude with this thought: no matter how a tradition might change, Jesus is a constant in my life.